I must say that the famous saying “old is gold” is really true. Few days back I had general curb side talk with colleague about new actress and upcoming talent in Pakistan. We have a pool of new emerging talents on television screen, we see every next month a new face in every other drama. But we must accept the reality that there is not even a single one to compare with the living legend Bushra Ansari in the whole showbiz industry of Pakistan. As far as I know Bushra Ansari is a Pakistani television singer, presenter, and actress and play writer. She started her career as a child actor in the 1960s and has remained a most famous and major TV person. 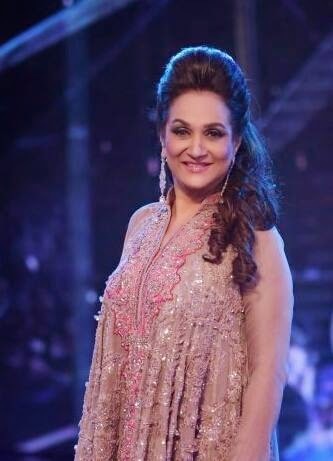 Bushra Ansari was born in Karachi, and is the daughter of well-known writer and journalist Ahmad Bashir. She studied in Lahore and completed intermediate education at Lahore College for Women University and received a B.A. degree from Rawalpindi's Viqar un Nisa College for Women in 1977. Her first dramatic acting role was in one of Iqbal Ansari's productions and, in succeeding years, on air on PTV’s most watched TV shows, her most famous drama was Angan Tera, comedy TV series Fifty Fifty. She also has the privilege working with greatest Pakistani legendry personality Sir Moin Khan in early years of her career. Few years back I saw Bushra Ansari with her daughter appeared in an advertising campaign for a diapers’ company. As being a living legend Bushra has won several awards, which includes the Pride of Performance Award as well as being the most famous personality, she has been even recognized by the government of Pakistan Presidential award from Ex-President Pervez Musharraf and a Women's Achievement Award from Ex Prime Minister Benazir Bhutto. Bushra Ansari is multi-talented women in Pakistan history. She has a mesmerizing voice and she also started her singing career few years back. She was also honored by being a part of Pakistan’s first ever music competition show called “Pakistan Idol” as a judge.